How Many Metadata Repositories Are You Managing? Most media and entertainment companies utilize multiple databases to track various types of media. Legacy asset databases, logging tools, newsroom systems, digital rights management systems, and media asset management systems all are actively used to track various types of media assets. Often these databases run in parallel to the post production workflow and are referenced on an "as-needed" basis. Parallel databases make it cumbersome to access assets outside the post production workflow as if you can't easily search for an asset, will you even look for it? AutoIngest Metadata enables all relevant metadata to be consolidated into Avid Interplay, MediaManager or into shared bins on Avid or 3rd party shared storage so that all assets can be searchable from a single seat or application! How Much Time Do You Spend Searching or Deleting Media? Network administrators tell us that these activities take up the bulk of their time....every day. The root cause to these inefficiencies is typically poor quality or inconsistent metadata. Either field names are not descriptive enough or descriptive terms are common to multiple assets. These inefficiencies are often caused by the lack of a defined schema, multiple schemata or a poor taxonomy. The presence of parallel metadata databases is often a primary cause to these workflow issues! Consolidating metadata repositories with AutoIngest Metadata addresses workflow inefficiencies as organizations are then able to build consistent "naming conventions" or schema and taxonomy. With a consistent schema and taxonomy in place, media organizations will save time and realize maximize revenue opportunities as more media assets are quickly found, tracked, and leveraged! Are You Planning a Digital Video Archive? Until now, there was little to be done in preparation for a digital archive project. Consequently, prior preparation often focused on technology assessment and not on metadata quality or workflow efficiency and impact. AutoIngest Metadata makes it possible to consolidate, assess, and prepare metadata prior to installing the "heavy iron". This step provides focus on the most important asset: the METADATA. Once all metadata is consolidated, schema or "naming conventions" can be assessed, unused or duplicative fields can be identified (eg: validate the taxonomy), and missing or thin cells can be identified. One specific and critical benefit is that this process enables the prior identification of records lacking required metadata (eg: tape name, time code) or that have illegal characters! Is Your Legacy Metadata Valuable? Do you have databases that contain rich metadata entered years ago? Are you maintaining these databases simply because you do not want to lose this rich metadata? 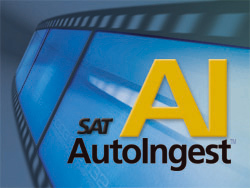 AutoIngest Metadata can ingest rich legacy metadata, in XML or text format, directly into your Avid workflow. Rich metadata can then be accessed directly from within the post production workflow and also preserved and maintained along with current metadata assets. 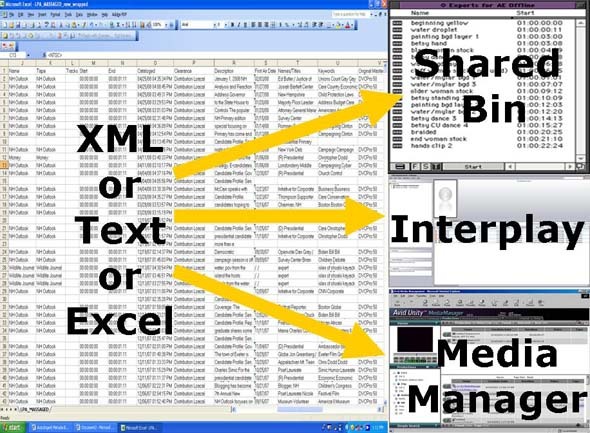 When the legacy asset is digitized or imported, the media file can be quickly "linked" to the original metadata.